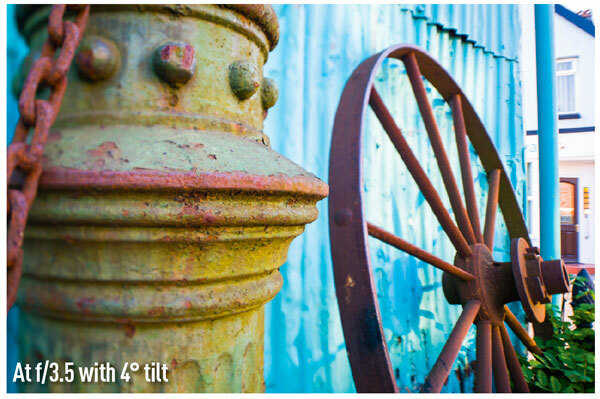 Tilt-and-shift lenses feature the film-plane-movement control normally associated with large-format monorail or studio cameras. They are considered to be very specialist kit designed for architectural and landscape photography where adjustment of the plane of focus and distortion control are key elements. Traditionally, tilt-and-shift lenses have been so expensive that the casual snapper hardly dare touch them. However, at under £1,000, Samyang’s T-S 24mm f/3.5 ED AS UMC is the most inexpensive of its type currently available, and includes features comparable with the benchmark Nikon and Canon tilt-and-shift lenses. Available in a range of mounts, it brings tilt-and-shift capability to a wider audience of DSLR users. In common with all other Samyang DSLR lenses, the aperture on the T-S 24mm is set manually on the lens ring in 1⁄2 stops from f/3.5-22. You won’t find the f-stop value recorded in the camera metadata unless you set it up specifically. Focusing is manual only, but this has always been the case with tilt-and-shift lenses – the considered and precise workflow dictated by these lenses would never suit autofocus anyway. Also, focusing down to a minimum distance of 20cm means the lens is well matched to studio close-ups and confined shooting conditions. The optical design is nevertheless advanced, and consists of 16 elements arranged in 11 groups, including two aspherical and two extra-low dispersion (ED) elements, designed to reduce chromatic aberration. The UMC coating on the front element is a multi-coating designed to minimise reflections and increase contrast. The tilt-and-shift ranges are substantial and provide all the adjustment needed for normal operation, shifting 12mm in each direction in the axis parallel to the sensor, and tilting 8.5° each side of neutral. 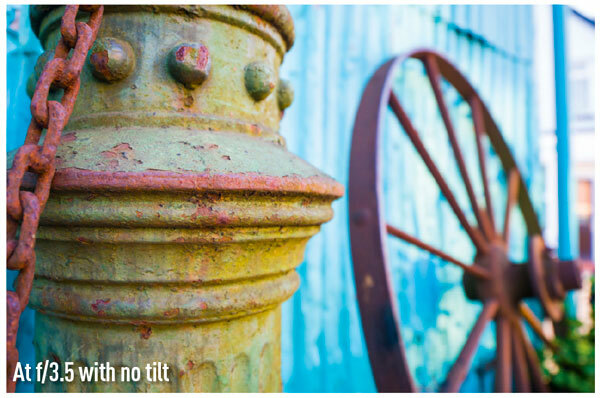 The alignment of the tilt-and-shift settings in relation to each other can be adjusted by rotating the lens mounting in 30° steps. In simple terms, the adjustments allow you to shift what the sensor is seeing within the covering area of the lens, and tilt the plane of focus so areas that wouldn’t normally be in focus at the same setting are sharp (or unsharp as required). The Samyang T-S 24mm f/3.5 ED AS UMC lens will fit a wide selection of current DSLRs from Canon, Nikon, Pentax and Sony, and adapters could expand the repertoire to include mirrorless and micro four thirds models.